EYHS-300 Two Dimensions Mixers are widely used in pharmaceutical, food, dye, feed, chemical fertilizer and pesticide industries. Two Dimensions Mixer mainly consists of three big parts, rotating cylinder, swinging rack and frame. The rotating cylinder is installed on the swinging rack, supported by four wheels, and its axial positioning is done by two catch wheels. Among the four wheels, two are driven by rotating system to make the cylinder rotate. The swinging rack is driven by a set of crank-rocker mechanism which is installed on the frame and the swinging rack is installed on the frame. long the swinging rack. Materials to be mixed rotate with the cylinder, and swing back and forth with the cylinder. As the result of these two motions, materials are mixed fully in a short time. Two Dimensions Mixer is suitable for mixing of all powder and granular materials. 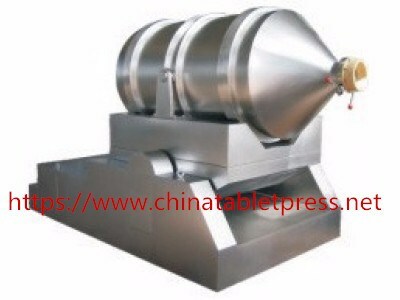 Two Dimensions Mixer is widely used in pharmaceutical, food, dye, feed, chemical fertilizer and pesticide industries.